An RFID chip is slighly larger than a grain of rice. 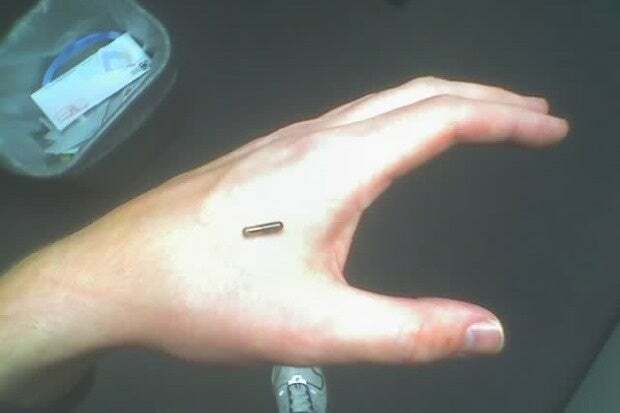 The RFID implants are a bit larger than a grain of rice, and Sjöblad's group tested the chips last year. Bionyfiken has just launched a nationwide study on RFIC/NFC implants. The goal of the Bionyfiken project is to create a user community of at least 100 people with NFC implants who experiment with and help develop possible uses. For example, applications could expand beyond access and include employee ID and location tracking. Participants in the Bionyfiken project normally pay for their own implants. There are even "implant parties," that involve from eight to 15 "implantees" and a bit of socializing around the experience. BioNyfiken is also working to change public perception and educate people on the idea that subdermal implants are not only harmless but, in fact, useful in everyday life. The fast-growing Bionyfiken RFID implant community is made up by a diverse group of people who see "experimenting with technology as a natural way of life," the organization's webpage states. "The chips are easy to insert and just as easy to remove. The life length of a chip implant is long. I expect mine to last for 10-plus years, but likely I will want a newer model before that time," Sjöblad said. Sjöblad believes getting an RFID implant is a highly personal choice "as it relates to individual integrity, which both I and my fellow Swedes consider highly important." "However, I fundamentally believe that smart implants are a technology of the future," he added. Not everyone is convinced inserting radio-transmitting chips with user ID information under your skin is a good idea. John Kindervag, a principal security and privacy analyst at Forrester Research, said RFID implants are simply "scary" and pose a major threat to privacy and security. While RFID/NFC chips, whether implanted or carried in a fob, are passive and not activated until they come within inches of an electronic reader, that reader can be hacked by impersonating another person's RFID chip to gain sensitive data. Additionally, nefarious thieves can also set up readers in inconspicuous places (such as retail stores) to activate RFID/NFC chips, stealing access to the same information. The difference between implants and popular mobile payment technologies, such as Apple Pay, is that an NFC implant would not typically be shielded. External RFID chips, contained in smart phones, fobs or cards, can be placed in sleeves or protective wallets that block the NFC signals until they're ready for use, Kindervag said. Sjöblad, however, said implants have the potential to greatly increase efficiency and simplify mundane tasks. RFID chips are already used as car keys and membership cards, as well as be used as passwords and pin codes for logging into smartphones, tablets and computers. "But this is really just a beginning. I believe it will be possible to use them for riding public transport within a year or two. I believe it will be possible to facilitate payments with implants within two years," Sjöblad said. "I believe they will have the capacity to replace fitness trackers within 3 years. And that, indeed, is still just the beginning." RFID chips could also be used to control activity, Kindervag warned. For example, if a fob is used to enable a vehicle's ignition, a driver who is late with a car payment could have that device disabled by the bank. "I think it's pretty scary that people would want to do that [implant chips]," Kindervag said. "That's a frightening apocalyptic vision, for sure."